There has been a misunderstanding between the City of Homer and Enstar Natural Gas. Enstar helped fund the extension of its natural gas line to Homer in 2013. The state funded part of the extension too. However, the city and some in the Legislature were unaware that Enstar’s contribution was actually a loan with interest. Customers are supposed to pay the gas company back through an extra charge on their bill. During Monday’s Homer City Council meeting, Mayor Ken Castner made an announcement. He says he discovered that Homer gas customers owe millions of dollars more than originally anticipated to Enstar for extending natural gas services from Anchor Point to Homer. Back in 2012, the Legislature appropriated $8.1 million toward the project. 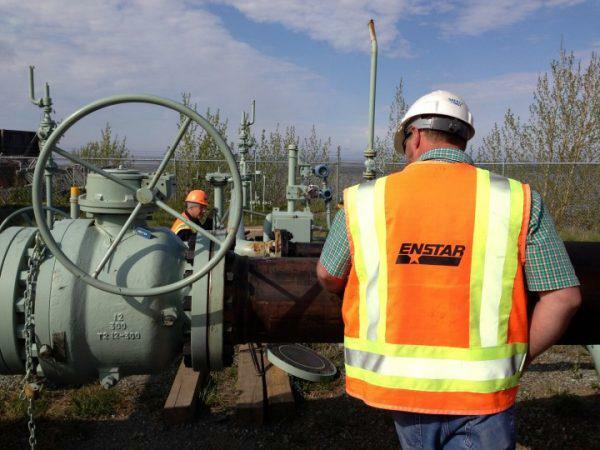 The idea was that Enstar would invest $2.5 million of its own money to cover the rest of the cost of expanding their pipeline network, and customers would pay back that money through a surcharge on their bill over 10 years. City Manager Katie Koester was still working as a legislative aide at the time, but she says that was the city’s understanding up until recently. “All of the grant agreement and the information that the city has, it’s $2.5 million,” Koester explained. However, the total cost to build the gas line was higher than originally thought. Customers in the Homer service area – that includes the City of Homer – wound up on the hook for roughly $3.6 million. A portion of Enstar's request to the Regulator Commission of Alaska in 2003 to establish a tariff for the future gas line extension to Homer. The RCA approved Enstar's request. On top of that, Enstar’s investment is actually a loan with interest, something the city says it was completely unaware of. Mayor Castner says if the city knew that information, it may have considered stepping in to borrow money at a lower rate in conjunction with acting as a pass-through for the state's grant. Former Homer House Rep. Paul Seaton says he doesn’t remember that detail coming up when the deal was presented to the Legislature either. Enstar Spokesperson Lindsay Hobson says Enstar was transparent about the deal. “For every Enstar investment, much like a bank, there is an equity return that’s attached to those funds,” she said. The particulars of this loan date back to 2003 when Enstar went to the Regulatory Commission of Alaska, which regulates utility rates, to ask if it could preemptively set up such a deal. The expectation was that the company would eventually expand to the southern Kenai Peninsula. The commission approved Enstar’s request saying that future customers in Homer would pay for construction costs and taxes associated with the potential project. The commission also said customers would pay interest on Enstar’s total investment. The surcharge that is supposed to pay off that loan is tied to how much gas they used. However, since the gas line was actually installed, Homer customers are using significantly less gas than Enstar had anticipated. Hobson says that means the loan isn’t being paid off as fast. “Because of the equity return portion and because of the low consumption in Homer, the balance continues to grow rather than shrink,” she explained. At the end of 2017, customers owed $5.5 million. Enstar realized it made a miscalculation and returned to the commission in late 2015 to ask if its customers elsewhere in the state could help pay down the loan through a rate hike, another process Homer city officials say they were unaware of. The commission said spreading Homer customers’ debt over Enstar’s base would create an “undue burden” on other customers. It indicated that it may be in favor of Enstar increasing the surcharge for the Homer service area if it were to present such an idea. Hobson says Enstar plans to present the commission with a plan to handle the growing balance, but she didn’t say when that would happen. Those like Seaton are paying close attention. He says if Enstar does not adequately address the situation, he’ll try to catch his former legislative colleges’ attention. “Then we’re going to have to have a major campaign to look at reforming, through the RCA, the way in which gas companies are allowed to charge and work on capitalization in this state,” he said. The City of Homer is looking into the situation and could also be taking action with the commission. Mayor Castner says he has made Homer’s neighbor, Kachemak City aware of the situation as well.